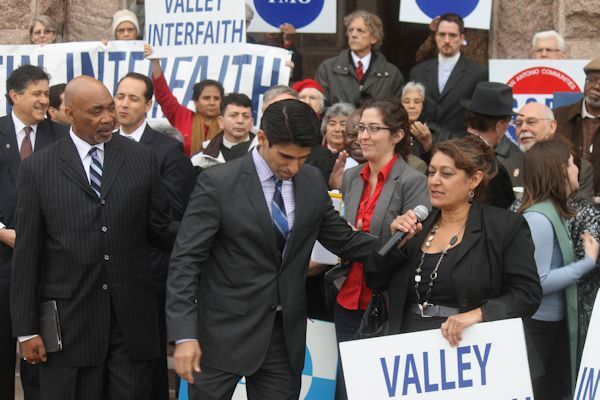 "Valley Interfaith leader Rosalie Tristan gave two personal healthcare stories to highlight the need for expanding Medicaid. Tristan...spoke of her 55-year-old brother, David Contreras, a husband and father of two. He has a tumor on the back of his head the size of a melon. He has been told he has to come up with $10,000 in order to see a doctor. He does not have $10,000. He has also been told he cannot go to the emergency room of his local hospital until the body tissue bursts. He earns too much to qualify for Medicaid...."